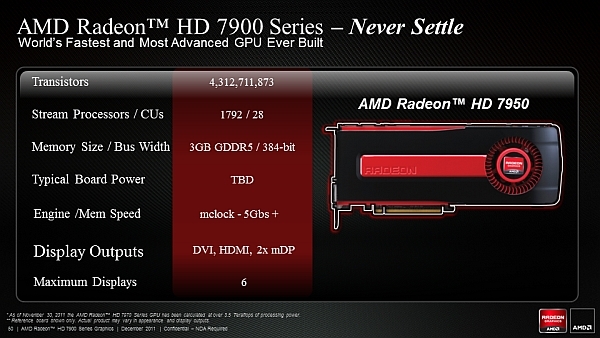 After the release of Radeon HD 7970, we spotted today the specifications of the Radeon HD 7950, a lower version with a lower price also for the enthusiasts featuring the same Graphics Core Next (GCN) 28nm GPU architecture . The Radeon HD 7950 is a Tahiti-class GPU code named "Tahiti Pro" same as the one on the HD 7970 but with lower Compute Units number. A slide leaked show specifications of the card, with lower transistors number 4.3 billion transistor, 1792 Compute Units compared to 2048 units on the HD 7970, the GPU is connected to 3GB of GDDR 5 using the same 384-bit bus with 5Gbps transfer speed, one DVI, one HDMI and two mini-DisplayPort video outputs as well as PCI Express 3.0 and DirectX 11.1 compatibility, the memory speed is not announced yet but we guess it would be about 150Mhz lower than the HD 7970. The price and release date is still unknown, for sure they will appear very soon so check us as soon as possible.